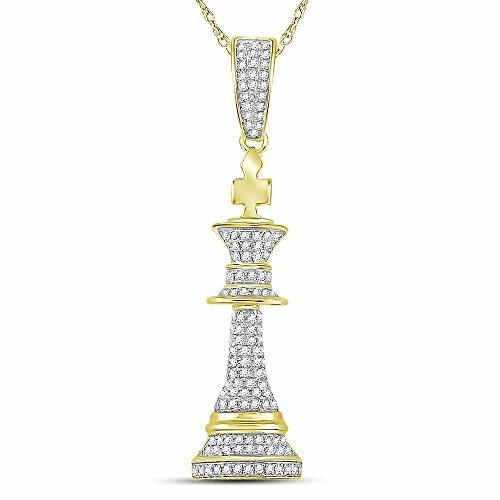 10kt Yellow Gold Mens Round Diamond King Chess Piece Charm Pendant 3/8 Cttw (I2 clarity; I-J color) | What Should I Say? 10kt Yellow Gold Mens Round Diamond King Chess Piece Charm Pendant 3/8 Cttw. â€ Combined diamond weight of 3/8 carats total weight represents a range of 0.37 - 0.45 cts. t.w. Reversible 10k White Gold St Michael Medal Protection Charm US Air Force Pendant Necklace, 22"
High Polish 14K Yellow Gold Plain and Simple Religious Cross Pendant Cuban Chain Necklace, 24"
14k Yellow Gold Eastern Orthodox Cross with IC XC Charm Pendant Necklace, 16"
Solid 14k Yellow Gold Textured Angel Wing Charm Pendant Necklace, 16"
14k Yellow Gold Crucifix Cross Pendant with 1.7mm Flat Open Wheat Chain Necklace - 18"
14k Yellow Gold Catholic Saint Michael The Archangel Pendant Necklace (1.35"), 22"